This Norwegian cheese is made under the Ski Queen brand from a mixture of cow and goat's milk. It has a unique, sweet flavor due to the way in which it is processed. 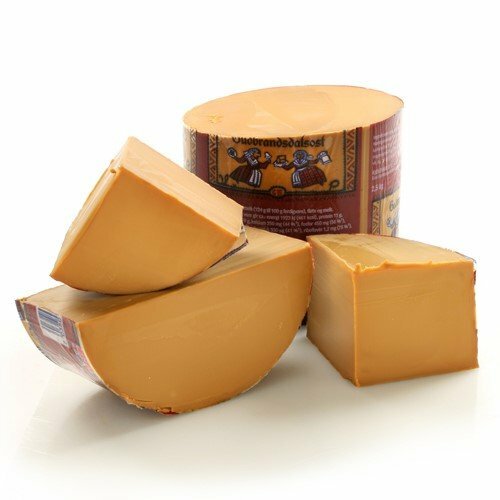 The milk is cooked until the sugars in it have caramelized, giving the cheese its distinctive brown color and sweet flavor. The milk is then curded and pressed. This distinctive Norwegian "brown cheese" (brunost) became popular as a skiers' snack and thus the label "Ski Queen". It is widely popular among Scandinavian-Americans, and children especially are drawn to its sweet flavor. Made from pasteurized cow and goat's milk. Whole form is 5 lbs.